On November 13, 2002, four years of prayer, discernment and hard work by the Sisters of the Presentation came to fruition when the doors to the Presentation Lantern Center opened to the public. Since then, the center's staff and volunteers have listened to the stories of hundreds of new immigrants from across the globe. Presentation Lantern Center functions as a hub of connection for its drop-in visitors. This center offers hospitality, educational opportunities and advocacy for women and children who are striving to better their lives. 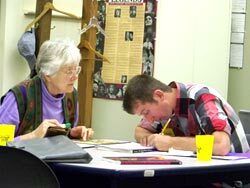 As visitors and tutors work together, they discover common values between one another. Volunteers help people learn English and adjust to living in a new place. 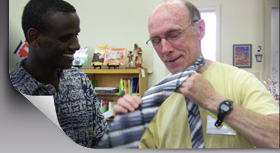 Learn more about the Presentation Lantern Center ministry.